The Online Store enables you to create a signup form for customers to submit their email addresses. 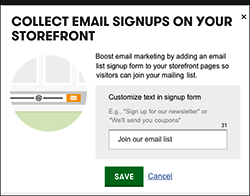 Using this feature, along with the included GoDaddy Email Marketing Starter Plan, lets you boost return store visits by alerting subscribers to sales and other promotions. This feature is available only in these English-speaking countries: the United States, the United Kingdom, Canada, Australia, New Zealand, Ireland, Philippines, Singapore, and India — regardless of the currency used on your store. At the top of your screen, go to the Promote tab and click Promote, and look for the Email Signups panel near the bottom of the page. In the Collect Email Signups On Your Storefront window, enter a custom message for your customers. The Promote Your Store page reappears where you can Turn Off or Edit the signup form any time.